Authentic Spanish paella, which was first seen during the 18th century near the coastal city of Valencia, has much in common with American barbecue. Like barbecue, it began as a poor peoples’ food, cooked outdoors over open fires, served as a communal dish that brought laborers together for the midday meal. This summer, we encourage you to explore this tradition and bring together your friends and family over the delicious blend of rice, vegetables, and protein that make up this delightful dish. 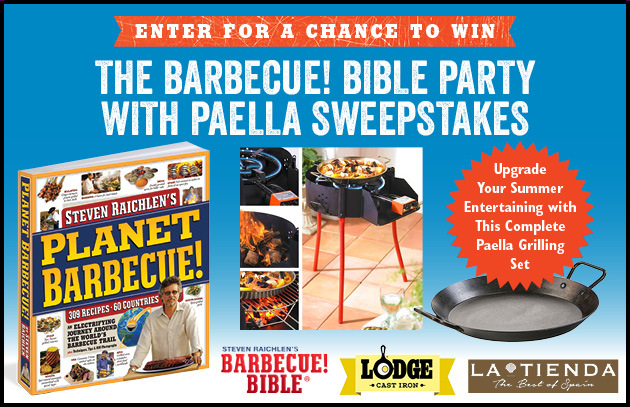 To help you bring this tradition alive in your backyard, we’ve partnered with our friends at La Tienda and Lodge Cast Iron to bring you the Party with Paella Sweepstakes! Lodge’s 15 Inch Carbon Steel Skillet: In this skillet you’ll find the durability we’ve come to expect from a Lodge product combined with the perfect shape and design for paella. A copy of Steven Raichlen’s Planet Barbecue: 309 recipes from 60 countries around the world (including paella!) make this cookbook a must-have for grillers looking to expand their repertoire. Use your email address or log in with Facebook to complete your entry below. NO PURCHASE NECESSARY. Open to US residents of the 48 Continental United States, age 18 years as of April 17, 2018. Sweepstakes begins at 12:00 a.m. Eastern Time (ET) on 4/3/2018 and ends at 11:59 p.m. ET on 4/17/2018. Click here for official rules. Void where prohibited. Paella is a festive and abundant dish that is meant to be shared communally. Give each diner a wooden spoon for scooping out a portion. Accompany the paella with grilled garlic bread for sopping up the juices, a green salad, and either White Sangria or a crisp, dry Spanish wine such as an Albariño or Txakoli. A paella pan is the preferred equipment for cooking this classic dish. It not only looks cool, but it encourages the rice to caramelize into a golden brown layer (called soccorat) on the bottom of the pan—the best part, some people say, of a well-made paella. Try Steven’s recipe for Paella on the Grill at your next gathering.